One of the truths about Wealth Management in India is that the average age of the clients tends to be higher. Logically, by the time most of us are able to accumulate wealth, we end up spending quite a few years in its’ quest. So, for a lot of my wealth management clients one of the main objectives is managing wealth to provide efficient cash flow for post retirement income. In that respect, the one strategy that I have been analysing and then recommending to a lot of clients is the Systematic Withdrawal Plan or SWP. One of my close school friends and I have now been trying to connect for a long time, especially since her mother had said she would like my suggestions for her post-retirement actions on the corpus. Considering both me and my friend are running on the treadmill of daily life, I thought I must pen down this as a pre-read of sorts for my friend’s mother so that it could ease the discussion when we do end up having it. With personal finance, one of the biggest road blocks is the complicated names given to very useful products or services. Systematic Withdrawal Plan or SWP is referred to the act of investing in mutual funds in a lumpsum and using that to draw a fixed income at regular intervals. SWP is the mirror opposite of SIP whereby SIP is a disciplined approach to creating wealth by investing monthly whereas SWP is the efficient approach to using wealth for a predictable periodic cash flow. So, for instance you have a lumpsum of Rs. 12,00,000. You decide to invest in a mutual fund with NAV Rs. 10, ending up with 1,20,000 units. You also put in a request for Rs. 10,000 SWP every month. Suppose one of the months, the NAV has dropped to Rs. 5, the mutual fund company will redeem 2000 units and credit Rs. 10,000 to your bank account. Suppose the NAV has touched Rs. 20, the mutual fund company will then redeem 500 units to credit Rs. 10,000 to your account. During retirement, a lot of people end up parking money in ultra safe harbours like Fixed Deposit. With our consistently increasing life expectancy, the need to have your retirement corpus grow while providing you with income is the need of the hour. Annuities and Pension plans are products made with the same basics in mind. However, most of those products come riddled with a host of expenses and end up with terrible return on investment. SWP on the other hand, ensure your money is not stagnant even while providing you with a regular income for living expenses. When we look at Mutual fund options for SWP, all funds are Open Ended. Most funds look at a 1% Exit Load for redemption within one year post which any redemption is not penalised. This provides way more liquidity than any of the other options like a Fixed Deposit or a ULIP or a Pension plan, which actually provides least transparency or fund availability. In case you look at putting a major chunk of your life savings to be deployed through the SWP route, this is an important distinction as in case of any urgent need of funds, the liquidity makes it convenient. Within Mutual funds, a lot of investors used to opt for the Dividend scheme to be able to invest in the market and still get an income. If there isn’t any need of income, Growth schemes should always be preferred as the impact of compounding and capital appreciation is truly felt in those schemes vis-a-vis Dividend schemes. However, imposition of the Dividend Distribution Tax whereby fund houses have to deduct a 10% tax at source before credited Dividend Income to the investors makes the Dividend scheme even poorer in comparison. On the other hand, with SWP, investors are liable to look at only the gains (selling NAV – purchase NAV) on the units being redeemed during the periodic withdrawal. This gain is different at every period depending on the market movement. As with SIP, volatility is a friend of SWP. When the NAV goes much higher, less number of units are redeemed for the income. When NAV goes much lower, more units are redeemed, but there could potentially be losses to set off or carry forward for the next seven years. As you can imagine, SWP is suitable for investors who have lumpsum amounts to invest and are looking to generate a regular income from it. Retirees are one of the biggest segments of population who can really utilise this strategy effectively. What type of Mutual Funds work well for Systematic Withdrawal Plan? There are three main categories of Mutual Funds – Debt, Equity and Hybrid (Debt + Equity). Debt Mutual funds invest in fixed income assets like bonds and debentures making it a low risk low return avenue. On the other hand, equity invests in the stock market making it relatively high risk high return. These are two ends of the spectrum with Hybrid being a category that bridges the gap. Hybrid funds are those funds that have the capital appreciation potential from the equity segment and stability during market fluctuations due to the debt segment. In essence, hybrid funds balance the risk with lower volatility making it a win win for SWP. Within Hybrid, ensure to choose Equity focussed Hybrid funds like Aggressive Hybrid or Balanced Advantage which allocate more than 65% to equity and are treated as equity for purposes of taxation. This ensures that gains in the first year alone are treated as Short Term Capital Gain (STCG) whereas anything withdrawn or redeemed after one year is treated under Long Term Capital Gain or LTCG. 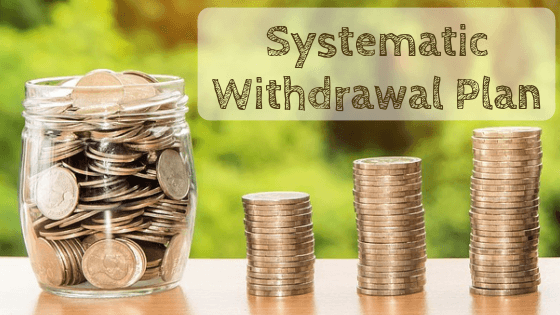 What is a safe rate for Systematic Withdrawal Plan? Over a long run (five to ten years), 12% is a good rate of return to expect from Hybrid funds. However, considering that compounding takes some time to show its’ effect and allowing for some market fluctuations, 10% should be the maximum that you should look at redeeming annually. If you have enough lumpsum, you could well look at keeping the withdrawal rate to 8% per annum which would give you far more margin to play with. These numbers quoted above are proportions of the entire portfolio or fund value to be withdrawn annually. This can further be broken down into smaller periods like quarterly or monthly. For instance, you invest Rs. 30,00,000 (30 Lakh) in a mutual fund. The maximum you should look to withdraw is Rs. 3,00,000 (3 Lakh) every year. This can be set in at either Rs. 75,000 each quarter or an amount of Rs. 25,000 monthly. Since each redemption is made at a variable NAV and gains are to be calculated taking into account the purchase price, understanding the tax liability can get a little tricky. Especially with the new ruling last year which includes the grandfathering clause, calculating capital gain tax (short term or long term) is a little complicated. If you find it troublesome, ensure you take professional help to be on the right side of the law. Remember that these funds are linked to market performance and market returns. In case of an elongated slump in the market especially initially, there is a probability of some degree of principal erosion, even with the debt component in place. The good thing about keeping it market linked is the fact that over a longer period, markets will always balance out to appreciate the underlying capital, despite the regular withdrawals. Today, retirements are long and often run into multiple decades. While it’s good to hope that the same income is sufficient over the years, the impact of inflation will ensure that’s not the case. Try to keep your withdrawal rate to allow for enough appreciation so that you have the option of increasing the withdrawal amount in some years, to make up for inflation eating away your purchasing power. So, if you have some lumpsum and are looking to generate stable, predictable income out of it, know that annuity is not your only option. Consider Systematic Withdrawal Plan or SWP as a very viable, efficient and convenient option. What are your views on SWP? Let me know in the comments below.